This organization is a non-profit corporation under the laws of the State of Georgia, by name "Hanarry West Club, Incorporated". The purpose for which this Corporation is formed is to construct, own, and operate a swimming pool and other recreation facilities in the Hanarry West Subdivision, County of Gwinnett and State of Georgia for the exclusive use of its members and their families on a non-profit basis. ”Membership” is associated with a specific address and includes all the people who normally live in the home. Those visiting the membership address, even if they are relatives, are considered guests. 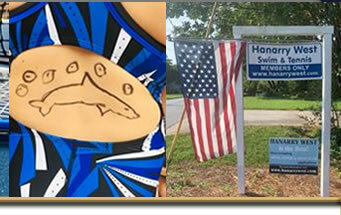 Membership is open to those living at all addresses: One does not need to live within the Hanarry West subdivision to be eligible for Club membership. A membership year is defined as May 1 through April 30. A goal of the Club is to enroll at least 150, but no more than 170, memberships. A form of annual membership pass, currently in the form of two “luggage” tags that can 24 be attached to bags, will be given to members as dues are paid. Membership categories, such as “annual” and “equity,” are further described below (Article V). If an equity member leases his/her home, the renters may pay the reduced equity rate. To obtain the reduced rate, the renters must clearly indicate, in writing, the name of the equity member/property owner. Cancellation of membership depends upon the membership type: annual or equity. Annual members who do not apply for renewal by 1 June will be presumed to have cancelled their membership. Equity members, who donated $500 to the Club to obtain equity status, must send written notice to a member of the Board stating their desire to cancel membership. This notice must be sent the same year the member is not renewing; one may not “skip” a year and then request an equity refund. Once this notice is received, the equity member is entitled to a partial refund of the equity donation. The number of current club memberships determines the size of the refund when the cancellation notice is received. The intent is to prorate the equity deposit so that a member would continue to be eligible for the reduced equity rate, but would have donated their equity down payment to the Club. Equity members who joined prior to September 2013 can opt-in to accept the revised refund calculation based on the year they became equity members. In order to be eligible for the equity refund, one must be in good financial standing with the Club. If an equity member did not completely pay the previous year’s dues, he/she is not eligible for the equity refund. Yearly dues are not refundable. Former or previous members must join the Club again in order to participate in Club activities. Former or previous members can play on a tennis team paying the out of court fees (amount established by the Board) if they have not been a member for longer than two years (calculated as 8 seasons of tennis from when was last a member). There are two broad categories of membership: annual and equity. Annual members pay yearly dues. Equity members donate $500 to the Club to obtain reduced annual dues. When an equity member leaves the Club, he/she may request a partial refund of the $500 donation as described above (Article IV). Some may wish to make partial equity contributions as “converting” members. However, only those who have completely paid the $500 equity donation are eligible for reduced annual dues. Applicants are considered to be “new” members if they were not members of the Club for at least three years. Those applying to the Club who were members at any time within the previous three years are considered to be “renewing” members. For new members, dues may be prorated according to the following schedule. Note that the main expense of the Club is the pool. Renewing members may only receive prorated dues if approved by a majority of the Board of Directors. Payment schedules exist for those who apply for membership before the end of May. Those applying on or after the first of June will be expected to make a single, full payment. Members who do not meet payment deadlines may incur a 15% penalty for late payment. The membership fee or payment schedule may be revised by the Membership voting at the annual meeting (Article XIII). Equity Members pay $370 annually and annual members pay $450 annually for swim and tennis memberships. Three installment payments are due on 3/15, 4/15 and 5/15. Equity installments are $125 on 3/15, and $122.50 on 4/15 and 5/15. Annual member installments are $150, $150, and $150 due on 3/15, 4/15, and 5/15 respectively. Member families may each receive a $25 credit by donating at least 2 hours for a committee or individual volunteer opportunity. Limit one per Sept-August fiscal year. Credits will be given in the form of a check each fall. Board members or committee heads are not eligible for this discount. Senior Level Membership- The Senior Level Membership will cover two members from one household where one member is at least 55 years old by May 15. The members can be a spouse or domestic partner. The membership will include full benefits including pool and tennis privileges. If the member has children that use the pool, they will not qualify for the Senior Level membership. This is only for the members, 55 or older. Members who have already paid regular price for 2019 and wish to convert to this membership, please contact Suzannah or Angie. Cost for the senior level membership is $285. This level membership preserves those with equity status. No dues, or partial dues, will be refunded in the event that pool operations are required to be suspended for any period. All fees and other charges mentioned herein and hereafter are exclusive of taxes, if any, imposed by the Federal, State and other governmental bodies and agencies. expire at the annual meetings in 1974 and 1975 respectively. At the annual meeting in 1974 the members shall elect four members to the Board of Directors to serve a term of two years and at each annual meeting hereafter, the members shall elect the number of Directors required to fill vacancies. Each regular term starting in 1974 shall be for a period of two years. Members of the Board of Directors shall be eligible to succeed himself. Consistent with these By-Laws and the Articles of Incorporation, the Board of Directors shall: (a) Elect from members of the Board of Directors: a President, a Vice-President, a Secretary, and a Treasurer. Since this is a significant time commitment, Board Members will receive a rebate of 50% or their paid dues upon successful completion of their role as of 8/31. (b) Transact all Club business and make and amend rules for the regulation of the use of Club property. It may appoint and remove such officers, clerks, agents, or employees as it may deem necessary and may fix their duties and compensations. (c) Elect members of the Club. (d) Fix, impose and collect penalties for violations of these By-Laws and rules of the Club. (e) Constitute and appoint committees and define the powers and duties of the same. The Board of Directors shall designate the Bank or Banks in which the funds of the Club shall be deposited and determine the manner in which checks, drafts, and other instruments for the payment of funds of the Club shall be executed. The Board of Directors shall always require at least one Officer and the Treasurer to sign all checks, drafts, and other instruments for the payment of moneys drawn in the name of the Club. The Board of Directors shall select an individual to audit the annual financial statement. The report of the auditor shall be available to members at all times. The President shall preside at the meetings of the Corporation and of the Board of Directors. He shall be the administrative officer of the Corporation. He shall appoint, subject to confirmation by the Board of Directors, all standing committees designating the Chairman thereof, and all special committees as may be directed. He shall be, ex-officio, a member of all committees. The Vice-President, in the absence or disability of the President, shall act in his stead. He shall, under the direction of the President, attend to the business operation of the Corporation. He shall be, ex-officio, a member of all committees. The Secretary shall send out notices of the meetings, keep the minutes, and attend to the correspondence pertaining thereto and any other correspondence involving the Corporation. The Treasurer shall keep the accounts of the Corporation, collect all revenues, pay the Corporation's bills as authorized by the Board of Directors, deposit funds of the Corporation received by him in the name of the Corporation in such depository as may be authorized by the Board. The Treasurer shall submit a financial statement and a statement of estimated receipts and expenditures at the annual meeting. In the event of a vacancy on the Board of Directors, the remaining Directors shall by a majority vote elect a temporary successor until the next annual meeting at which time a permanent successor to fill out the remaining term shall be elected. The Board of Directors shall meet at least once a month during May, June, July, and August and at such other times and intervals as they may deem necessary. Five members of the Board of Directors shall constitute a quorum. The Board of Directors shall hold its first meeting following the annual meeting of the members, in each year as soon as practicable. Special Meetings of the Board of Directors may be called by the President and shall be called by the Secretary upon the request of two members of the Board. Notice of the meetings shall be given each member of the Board by the Secretary at least seven days before the meeting. This notice shall give the place of meeting, the date of the month and the hour of the meeting. The annual meeting of the Club starting in 1974 shall be held the month of September in each year at such place and time as the Board of Directors may designate. The annual meeting shall be for the purpose of electing Directors, presenting committee reports and for the transaction of such other business as may be indicated in the notice or may be brought before it. Notice of the annual meeting shall be given to the members at least 14 days prior thereto. Special meetings of the Club membership may be called by the Board of Directors, also upon written request of 10% of the active members to the Secretary stating the purpose therefore. The meeting shall be called by the Secretary within thirty days. Notice of Special Meetings shall be given to all members at least seven days before the date of Meeting. The notice shall also state the purpose for which the meeting was called, and no other business shall be transacted at the meeting. Only Active members shall be entitled to vote at meetings of the Club. Members not able to attend may be represented by written proxy. Voting shall be by viva voce but 10% of the Active Members present, including those represented by proxy, have the right to demand voting by roll call. An Active member is a member who has paid membership fees and the current year's annual dues. 25% of the Active membership shall constitute a quorum and must be present or represented by proxy in order to transact any legal business of the Club. Whenever in these By-Laws notice to members is required, the mailing of such notices to the known address of the member shall constitute notice. Any recommendation for capital expenditure in excess of $5000 must be presented to a meeting of the Club membership as prescribed in Article X, Section 4 and 5. Since this is a significant time commitment, Committee heads will receive a rebate of 50% of their paid dues upon successful completion of their role as of 8/31. The duties and powers assigned in these By-Laws to the Standing Committees shall be subject to the authority of the Board of Directors. The Rules Committee shall prepare rules of health, safety and good conduct in connection with the operation of the pool and other facilities of the Club. It shall be the duty of this committee in conjunction with the Pool and Grounds Committee to see that the rules and regulations of the Club are enforced. The Pool and Grounds Committee shall exercise supervision over the pool and grounds, and in conjunction with the Rules Committee shall see that the rules and regulations of the Club are enforced. The Finance Committee shall prepare the annual budget and advise the Board of Directors of the maintenance cost for the season and shall advise the Board on all financial transactions of the Club. The Activities Committee shall prepare the program of activities and entertainment and exercise supervision over the same. The Membership Committee shall solicit and receive the applications of residents within the boundaries listed and turn such applications over to the Board of Directors with the recommendation of the Membership Committee. A Special Nominating Committee shall be appointed by the President and approved by the Board of Directors at least two weeks before the annual meeting. It shall nominate a slate of Directors that are to be elected at the coming annual meeting and present this slate to the meeting. (a) Each person who acts as director or Officer of the Club shall be indemnified by the Club against expenses actually and necessarily incurred by him in connection with the defense of any action, suit or proceeding in which he is made a party by reason of his being or having been a Director or Officer of the Club, except in relation to matters as to which he shall be adjudged in such action, suit or proceeding to be liable for gross negligence or willful misconduct and except any sum paid for the Club in settlement of an action, suit, or proceeding based on gross negligence or willful misconduct in the performance of his duties. (b) The right in indemnification provided herein shall insure to each Director and Officer referred to in (a) whether or not he is such Director or Officer at the time such cost or expenses are imposed or incurred and in the event of his death shall extend to his legal representatives. (b) All members of the Club shall be accorded the facilities of the Club subject to the rules and regulations, which shall be posted at all times. (c) The Board of Directors may delegate to the Chairman of the Rules Committee or to a responsible employee of the Club the power to suspend privileges for the violation of Club Rules and Regulations provided such suspension does not exceed fifteen days. A written report of such suspension containing the reason therefore shall be submitted to the President within twenty-four hours. (c) Any member may for cause and after having been given an Opportunity for a hearing be suspended for a period not exceeding three months by a majority vote of the members of the Board of Directors present at any meeting thereof. The offending member may be expelled by three-fourths of the entire membership of the Board. Cause for suspension or expulsion shall in general consist of violation of these By-Laws or of the Rules and Regulations of the Club or of conduct unbecoming a lady or gentleman. The Board of Directors at its discretion may extend the privileges of the Club to any person or persons. No changes in assessments may be made against the membership at large unless approved by a vote of the membership at a general membership meeting. The Board of Directors may not incur capital expenditures in excess of $5,000 within any calendar year, and may not incur any debt which cannot be paid for operating funds for that particular year without approval by vote at a general membership meeting as prescribed in Article X, Sections 4 5, and 9. These By-Laws may be amended by a majority vote of the Active Members present or represented by written proxy at any meeting of the Club provided at least seven days notice of such amendment shall be given prior to such meeting to all members. A quorum must be present at the meeting in accordance with Article X, Section 7. Any amendment adopted shall become effective five days after written notice has been mailed to all active members. Membership fees and annual dues will be recommended by the board of Directors and approved by the membership. These By-Laws may be amended by a majority vote of the Active Members present or represented by written proxy at any meeting of the Club provided at least seven days notice of such amendment shall be given prior to such meeting to all members. A quorum must be present at the meeting in accordance with Article X, Section 7. Any amendment adopted shall become effective five days after written notice has been mailed to all active members. Membership fees and annual dues will be recommended annually by the board of Directors and approved by the membership. In consideration of 15 free memberships, the HWC acquired lease rights to the recreation property. These 15 memberships were assigned to 15 specific lot numbers. These 15 memberships are non-transferable, non-negotiable and nonrefundable and do not include annual dues, initiation fees, or other assessments. The lot numbers are on file. In the event of the dissolution of the Corporation according to the Articles of Incorporation in any manner or for any cause, and in no other event, upon the effective date of dissolution of the Corporation, the assets of the Corporation will be used to pay outstanding debts and any remaining assets will be distributed among the membership on a pro-rata basis. Each member shall be responsible for the payment of all charges or liabilities not covered by insurance that may be imposed upon or incurred by members of his family to whom the privileges of the Club have been extended and for all charges and liabilities imposed or incurred by his guests. All persons using the pool facilities do so at their own risk. The pool corporation will not be responsible for any accidents or injuries in connection with such use. The Corporation will not be responsible for loss or damage to personal property.